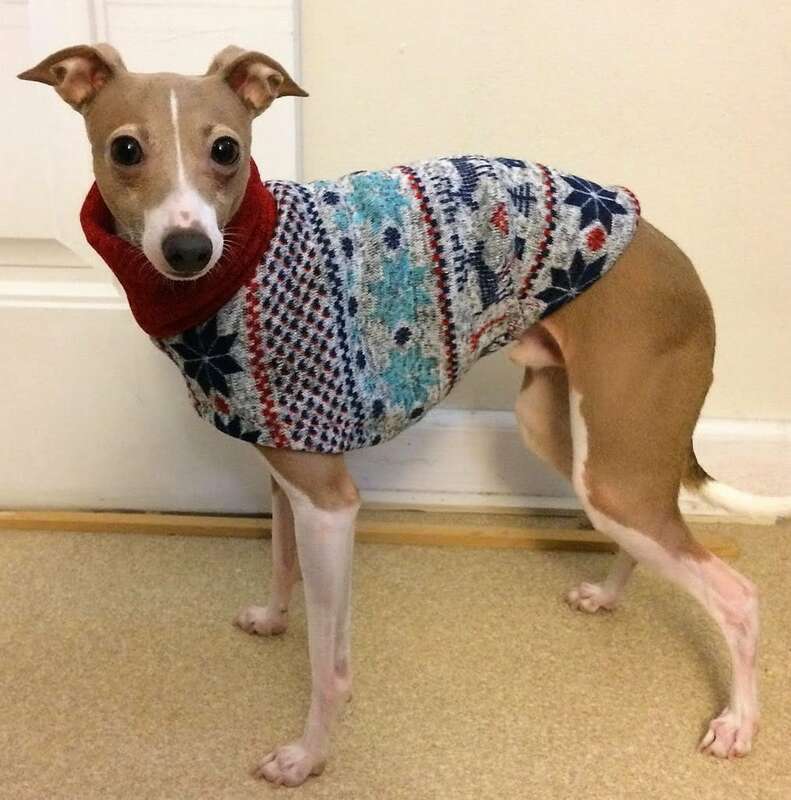 Your Iggy will be ready to hit the slopes in this adorable “Winter Wonderland Sweater.” The fabric is perfect for chilly walks or just hanging around the house. 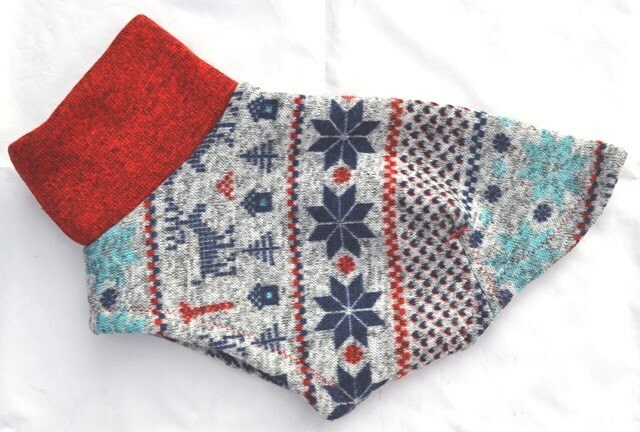 A soft sweater fleece that is a little heavier than regular fleece and has stretch to it for your hound’s comfort. The outside feels like a sweater and the inside is soft fleece. Patterns of snowflakes and reindeer on a grey peppered background. The mock turtle neck is made of the same sweater fleece as the bodice in a red with tiny black specks. 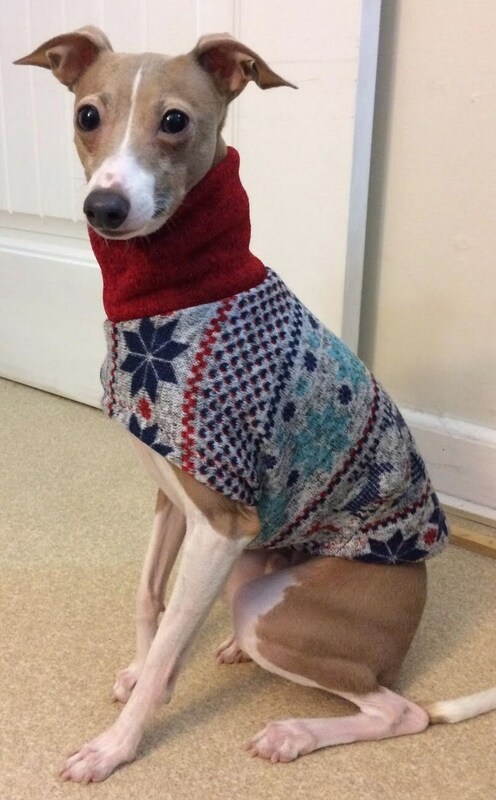 Remember, this is a Sweater and is designed to be a little shorter, so the trim lines stop around the front of your hound’s thigh. It does not cover the rear. Great for your next “Ugly Christmas Sweater” party! Color: Grey background with patterns of snowflakes and reindeer in Dark Blue, Red, and Teal. Care Instructions: Close Velcro and machine wash cold/ tumble dry. S/M = Fits Girth of 16 – 18 inches (largest circumference of chest). Length is 10 inches (from base of neck to base of tail). M/L = Fits Girth of 19 – 21 inches (largest circumference of chest). 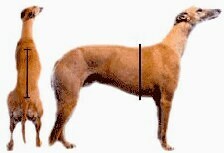 Length is 11 inches (from base of neck to base of tail).